The End of the 40-year Interest Rate Cycle? Is the decades-long regime of low interest rates ending? 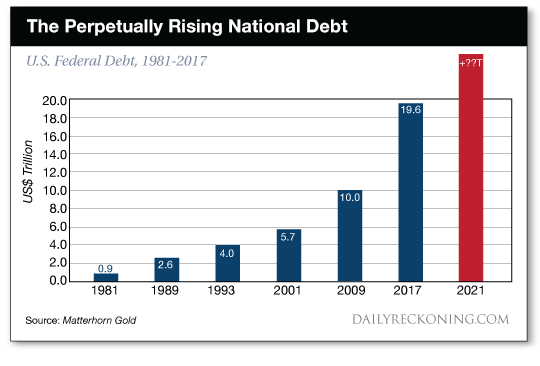 And will the stiff dose of rising rates shove this debt-drunk economy over? These are the questions that slump our shoulders today… and crease our brow. The United States has taken on trillions of dollars in debt since the early 1980s. Today the national debt crests above a preposterous $21.6 trillion. 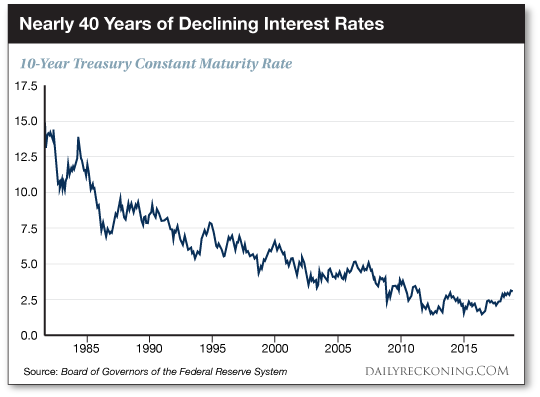 Meantime, long-term interest rates peaked in 1981… and dropped steadily thereafter. That is, the cost of debt declined for decades as debt itself was piling high. We present two graphs spectacularly in point. Let us remind you that the United States government has borrowed over $12 trillion alone since 2008. The 10-year Treasury yield sank to 1.38% by the summer of 2016 — a record low. But from their 2016 floor, long-term interest rates have been on the creep… like a choking grapevine snaking its way up a tree. The 10-year yield presently rises above 3%… a level it has held since September. That is a roughly 125% increase since its July 2016 trough. Meantime, inflation is beginning to bubble and gurgle — a tad here, a bit there. We recently revealed that manufacturers are paying nearly 10% more for aluminum than one year ago… and almost 40% more for steel. These rising costs you shoulder at the cash register. Rising inflation means higher interest rates. Substantially higher interest rates, in turn, mean debt service becomes an impossible burden. How will America service its $21.6 trillion debt? Rising debt twinned with rising rates already have debt service the fastest-growing government expense. A projected $390 billion next year, the Congressional Budget Office (CBO) expects $900 billion annual interest payments within a decade. Nine hundred billion dollars outstrips the entire current defense budget. It vastly exceeds present Medicare spending ($625 billion) and Medicaid ($412 billion). 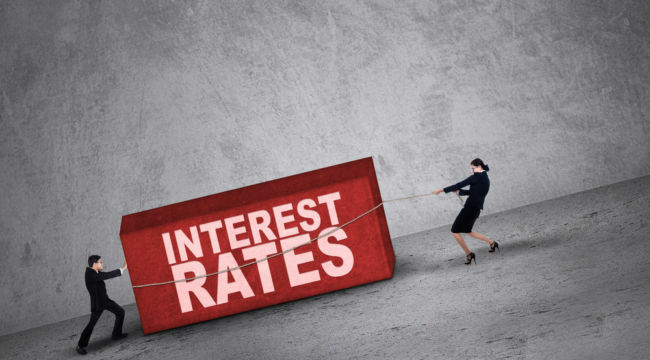 So the question becomes… is the era of falling rising interest rates over? And is a new cycle of higher interest rates underway? We are in the midst of a regime shift. I’m not talking about a cyclical change but rather a long-term, secular one. For all of my investing career — and for almost everyone’s entire investing life — interest rates have been falling. Disinflation that has occasionally morphed into outright deflation — think 2008 — has been the biggest trend in the world, proving for nearly four decades that investing genius is most often nothing more than a big ol’ bull market… All you had to do was ride out the rough spots… and wait for interest rates to fall and stocks to rally. The transition we’re in now — and have been for a couple of years — is from a long-term downtrend in rates and inflation to a long-term uptrend in rates and inflation. If I’m right, if we have seen the trough in rates and inflation, investing in the second half of our lives… is going to be a lot different than the first half. “If” he is right — of course. But is anyone prepared for the shift? Paul Schmelzing professes economics at Harvard. He has also conducted a study of interest rates throughout history. These cycles feature a secular decline of real interest rates, followed by sharp reversals. 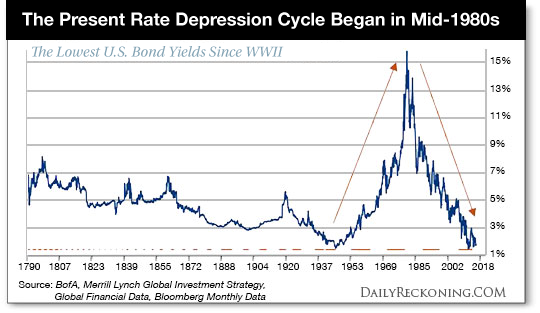 The world has been immersed in history’s ninth rate depression cycle. It began in the 1980s, as above described. Schmelzing’s research reveals the present rate depression cycle is the second-longest of the entire 700-year record… and the second most intense. 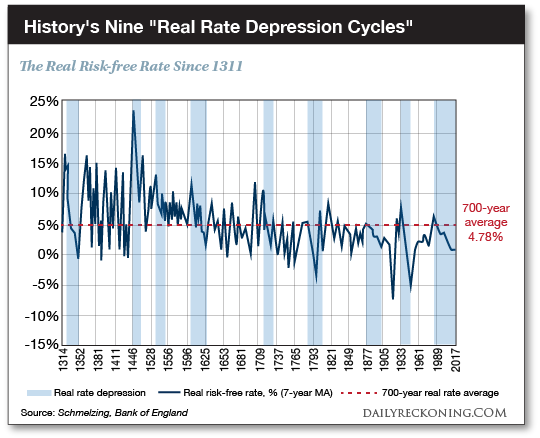 By almost any measure, today’s rate depression cycle is a thing of historic grandeur. If the term “reversion to the mean” has any currency, rates could accelerate… quickly. When rates do regain their bounce, history demonstrates they do so with malice. Again, 10-year Treasury yields have already gained two percentage points since their 2016 cellar. Could more be on the way? And is the current cycle over? A final verdict is premature. But the stock market and economic “recovery” have pivoted upon the fulcrum of ultra-low interest rates. If the current 37-year rate depression cycle is ending, a harsh lesson in mean reversion could be on tap. The current cycle is, after all, the second longest on record… and the second most intense. The evidence from eight previous “real rate depressions” is that turnarounds from such environments, when they occur, have typically been both quick and sizeable… Most reversals… have been rapid, nonlinear and took place on average after 26 years. After nearly 40 years, the present rate depression cycle substantially exceeds the historical 26-year average. Within 24 months after hitting their troughs in the rate depression cycle, rates gained on average 315 basis points [3.15%], with two reversals showing real rate appreciations of more than 600 basis points [6%] within two years. In reminder, 10-year Treasury yields have risen some 200 basis points since July 2016. Does another 400-point jump await? If so, will surging debt costs finally sink the economy? In fairness, we find no reason in law or equity why the second-longest, second most intense rate depression cycle in history… cannot become the longest, most intense rate depression cycle in history. The cycle could run years yet. Or it may have already ended. Again, the final verdict has not come down. But if not already ended… end it will.